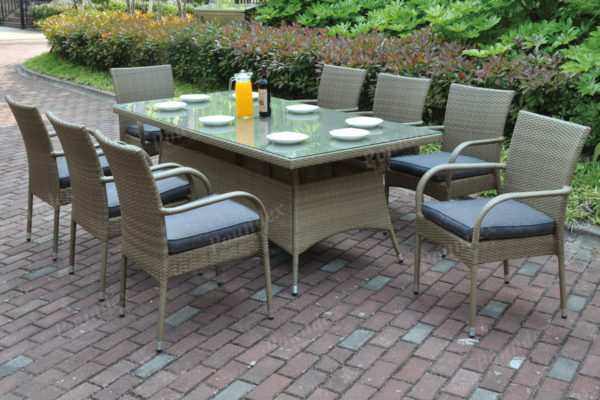 Have the time of your life with this 9-piece outdoor patio table set with seating for eight. 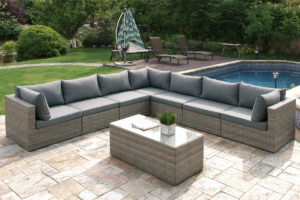 Trimmed in beautiful and durable resin wicker and an aluminum frame, it also includes simple style seating with seat cushions and high back supports. This set is all-weather and heat and rust resistant just for the outdoor environment. The furniture is exactly as pictured. Very easy to assemble myself. Only needed help lifting the glass on top. Beautiful set! Love this set! Needed it for a condo with a large patio that is a seasonal rental. Quality great, delivery quick and communication excellent.